Free Download Biology Warm Ups, Bell Ringers, and Interactive Notebook Pages: FREE DOWNLOAD sampler pack. 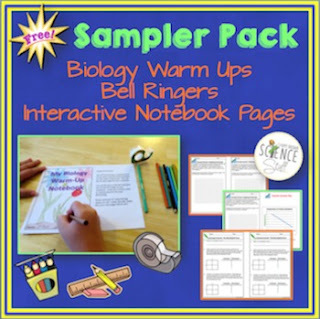 This free download contains a 2-page sample from each of my "Biology Warm Ups, Bell Ringers and Interactive Notebook" sets. No Prep!! These sample pages are ready to print and ready to use. No cutting or glueing required. Each warm up contains student pages and a teacher answer key. These sample pages are the actual pages that are contained in the larger bundles. • Completed notebook is perfect for semester exam review.